Under National Health Mission (NHM) each district has become the planning programming and financial unit on which the health program of the district depends. So, it depends up on the district leadership and functionaries how well the plan to improve the status of the district. Since inception of NHM in 2005 although the districts worked as the special entity but the focus was at the state level. Thus, the states with maximum poor performing districts were named as “Empowered Action Group” (EAG) although few districts in these states are more well performing than the well performing districts of well performing states. In 2018, Govt. of India planned to dig dipper in to the causes and to do focused activity in these poor performing districts so as to include them in to the main stream thus Aspirational Districts Program was lunched. Each Aspirational district are being monitored in six basic domains including Health and Nutrition, Education, Agriculture & Water Resources, Basic Infrastructure, Financial inclusion and Skill Development by 49 core indicators and 81 data points on a monthly basis. 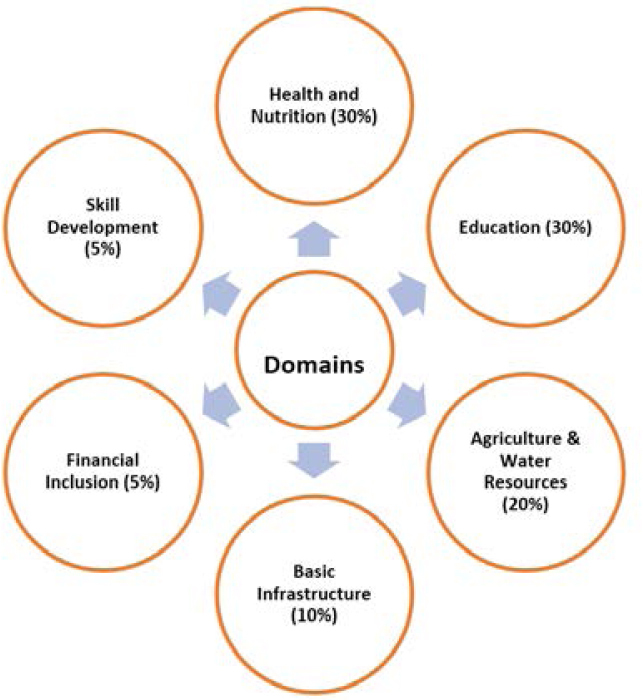 [Figure-1] All these domains are linked to the Human Development Index of the districts. Health receives the highest priority along with education followed by Agriculture and water resources. In health the major components include the maternal and child health component with health infrastructure and tuberculosis. A dash board named “Champions of Change” is also prepared to monitor the district progress round the clock is functional and districts also can monitor their progress in various domains. Aspirational District program under the basic principles of Convergence (State and National Government), Collaboration (between citizens and officials) and Creation of healthy Competitive environment between the districts where all can move forward. Here the state will act as the main drive for improving the district after identifying the core strengths and weaknesses of the district so that the district can become nations one of the best districts. So, the poor performing districts which are aspiring to become the best districts of the nation are called as the Aspirational Districts. Initially, the poorest performing 117 districts were included under this program based on their performance in various national surveys and other published district wise data for various programs. For health and nutrition indicators the surveys used was fourth round of National Family Health Survey (NFHS). A higher score indicates more backward district. Monitoring of progress of the districts are done by key core indicators. The source of all monitoring related data is the routine reporting from the districts in various programs. Thus, the quality of data collected and reported by districts in various programs should be of high quality. 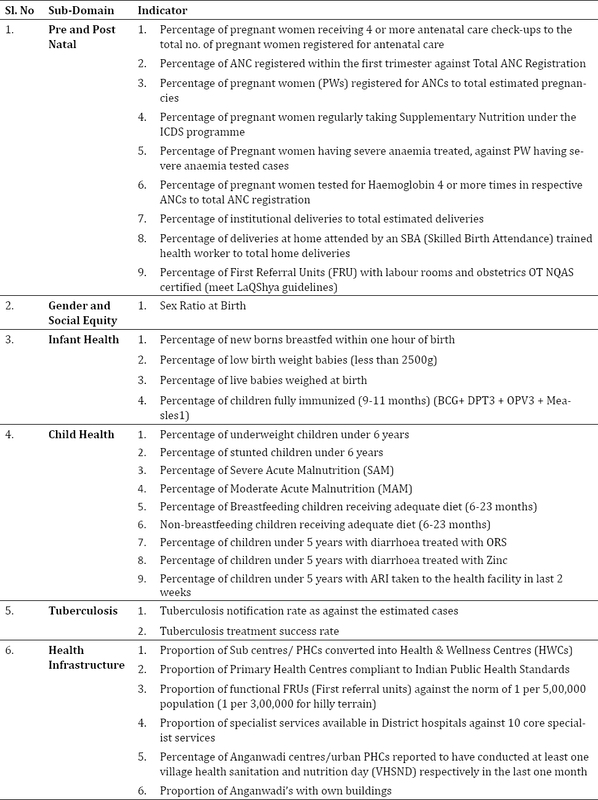 Key indicators related to Health are listed in [Table 1]. Indicators mainly targeted towards monitoring the maternal, child health, tuberculosis component in order to decrease the basic indicators of national importance i.e. Maternal Mortality Rate (MMR), Infant Mortality Rate (IMR), Under Five Mortality Rate (U-5MR) and tuberculosis incidence listed in Sustainable Development Goals (SDG). Similarly, the fourth domain i.e. health infrastructure will be helpful in achieving Universal Health Coverage (UHC). Based on these core indicators district has to identify a thrust activity and the related programs to it and also identify the loop holes, cross cutting issues and fix them. Many of the activities are linked with each other like Health is linked to basic infrastructure and financial inclusion. So integrated approach to address the issues remains the key to the success of the program. To perform these activities smoothly and to coordinate the activities between state and center NITI Aayog has identified Joint Secretory or Additional Secretory to serve as Guardians of the districts. Various partner agencies have been identified by the central government for helping the districts in various domains. The role of the partner agencies will be to do independent evaluation of the program. Funding for all these activities has to be channelized from the funds provided for the program implementation plan only. Additional funds have to be pooled from state funds and innovative methods like Corporate Social Responsibility (CSR), Dist. Mineral Fund etc. In this programme, the focus is more inclined at the district level than being centralized, which is indeed a positive sign. Similarly, coordination between state and center on a mutually agreeable point of development is also a positive sign. Few hurdles that the program may face at the outset is non-reporting or poor reporting when we are planning for real time monitoring of the districts progress. Before jumping in to the program per se the district has to identify such inactive reporting units and start reporting to get the actual baseline data. Second point will be the resources. Many health centers in state lack the appropriate manpower including basic field level workers like ANM and MPWs. Districts with these problems may take longer time than the other districts as getting adequately trained man power is a time-consuming procedure. At this point hand holding and mentoring by Public Health Institutions specifically at the state level and national level may provide additional boost in training the manpower and monitoring the progress. Similarly, financial constrains related to recruitment and training will become critical in districts facing human resource issues. Another problem the districts may face is the lack of skilled manpower do multitasking at each level as multiple activities will be going on simultaneously for many thrust activities. Here the role of quality program managers becomes important. This can be handled by fine tuning the human resource allocation and appropriation. When we analyze from the health specific point of view majority of the maternal health indicators are well included in the program but the neonatal care component is not appropriately covered. Home Based Post-Natal Care is one such critical link missed in the indicator list. Majority of the neonatal deaths and maternal deaths occur when they are discharged from the hospital due to infections in this era of institutional deliveries., In such cases improving the quality of the home-based care is critical to improve the maternal and child health. Such home based care is also more important in home deliveries. Universal Health Coverage (UHC) is an important public health concept in recent times. Many of the indicators for UHC are covered under aspirational district program but the indicators related to Non-Communicable Diseases, HIV and financial protection were not included. From public health point of view health cannot be a stand-alone agenda. It is always linked to other non-health domains like education, financial inclusion and basic infrastructure. Thus, the program well addresses the health & its related domains and may provide a long-lasting impact on the health indicators.